(TAMPA, Fla.) – AgileThought—a national provider of enterprise custom software solutions and development consulting to Fortune 1000 clients—announced that it will sponsor the BarCamp Tampa Bay 2018 event on Saturday, Nov. 10, 2018. The community-based tech event will begin at 8 a.m. in the West Wing of the University Mall in Tampa. Held annually, BarCamp Tampa Bay is a one-day conference for local technology enthusiasts to network, collaborate, and conduct peer-to-peer education on the latest industry topics and trends. The event is ideal for web designers, web developers, digital marketers, IT and security administrators, or anyone who has a personal or professional passion for technology. Presentation topics are diverse and range from UX and web design to cybersecurity and machine learning. Instead of having pre-planned speakers, the event’s presenters and agenda topics are determined on the morning of the event. All attendees who are interested in presenting will sign up in the morning and be chosen on a first-come, first-served basis. Speaker sign-ups will open at 8 a.m., sessions will begin at 9 a.m., and the event will wrap-up at 4 p.m. with an afterparty to follow. BarCamp Tampa Bay is a community event, both in participation and in funding. It is made possible by the time and money donated by the people who run the event, the attendees and sponsors like AgileThought. To register or learn more about BarCamp Tampa Bay, please visit the event website. 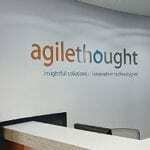 AgileThought is a full-service software consulting firm with specializations in custom software development, user interface and experience design, rapid prototyping, managed cloud services, data analytics and collaboration, SharePoint and business intelligence solutions, and agile and DevOps consulting and training. Formed in 2004, the company has been noted as one of the country’s Best Companies to Work For by Fortune magazine. It is currently listed on the Inc. 5000 list for the eleventh consecutive year and was also listed as one of the Best Company Cultures by Entrepreneur magazine. It serves Fortune 1000 clients nationwide from offices in Tampa, Atlanta, and Orlando. For more information, visit agilethought.com or call 1-877-514-9180.